In January of 1920, Punch published a poem by E.W. 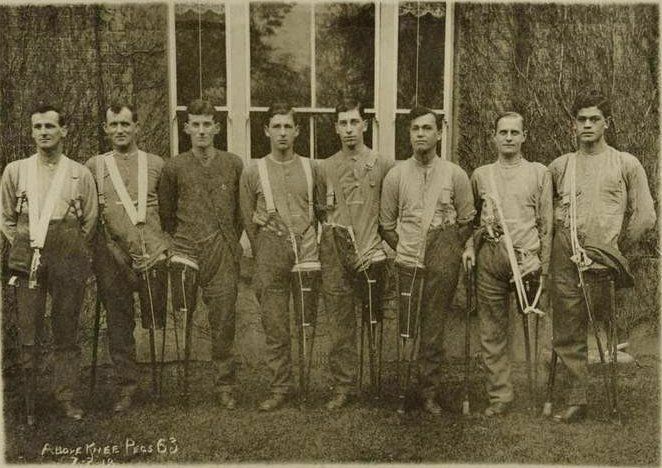 Pigott that tells of the costs born and the courage displayed by disabled veterans. 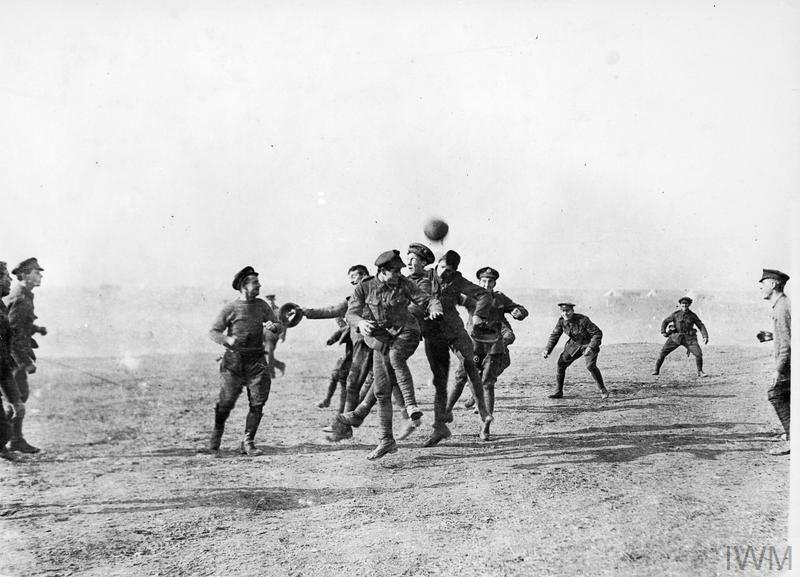 And have a game o’ football with the lads. But what’s the good of talkin,’ anyway? Over 40,000 British veterans of the First World War suffered the amputation of one or more limbs, while the number of war amputees in Germany totaled over 67,000.† In the aftermath of the Great War, the economic plight of disabled veterans was particularly acute as widespread social unrest spread and unemployment rose. 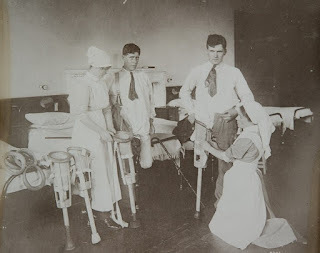 Loss of two or more limbs, loss of an arm and an eye, loss of a leg and an eye, loss of both hands or all fingers and thumbs, loss of both feet, loss of a hand or a foot, total loss of sight, total paralysis, lunacy, wounds or disease resulting in a man being permanently bedridden, wounds to internal organs or head involving total permanent disability, very severe facial disfigurement. *Read more about the footballers at Loos on the website of the London Irish Rifles Association. ** Deborah Cohen, The War Come Home, Univ. of California Press, 2001, pp. 4, 2. ° buckshee = something extra obtained for free (first known use 1919); Brads = “Between 1914 and 1928 £1 notes were issued that came to be called brads after Sir John Bradbury, Secretary to the Treasury” (David Crystal, Words in Time and Place); toot sweet = French phrase tout suite (immediately, with haste). 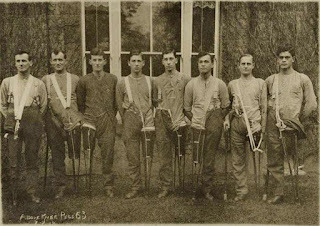 ***While it is nearly impossible to determine the author’s identity with certainty, the Imperial War Museum's Lives of the First World War lists a Lieutenant Edward William Pigott, who served with the London and East Lancashire Regiments. † For Britain, Joanna Bourke’s Dismembering the Male, Univ. of Chicago, 1996, p. 33; for Germany, Robert Weldon Whalen’s Bitter Wounds, Cornell UP, 1984, p. 40. 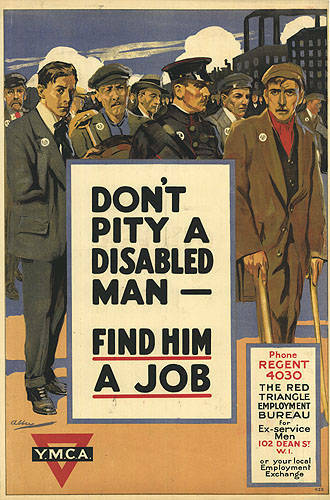 †† “War and Impairment: The Social Consequences of Disablement,” UNITE and UK Disability History Month, Nov/Dec 2014, https://ukdhm.org/v2/wp-content/uploads/2014/09/UK-Disability-history-month-2014-Broadsheet.pdf, Accessed 20 Jan. 2019. ††† Thanks to Dr. Jessica Meyer who shared these statistics from Joanna Bourne’s Dismembering the Male in a presentation at Voices from the Home Fronts, The National Archives at Kew, 20 Oct. 2018. †††† Thanks to researcher Louise Bell who shared this letter from The National Archives (LAB 2/1195/TDS2884/1919) in a presentation at Voices from the Home Fronts, The National Archives at Kew, 19 Oct. 2018. Nice to read again, nice post Connie.